Cause of death: Contract killing. Location: Palm Beach, Florida, USA. 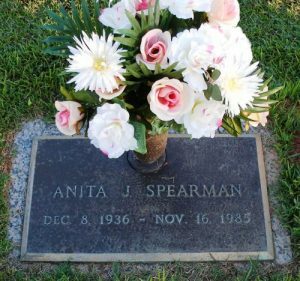 Anita’s husband was tired of being married to a woman who had cancer. He was worried she wouldn’t look good in a bathing suit, so he hired a hit man to kill her. The man bludgeoned her to death as she lay recovering from a recent mastectomy. Perpetrator: Robert Spearman (Husband), convicted of murder, sentenced to life plus 20 years; Sean Doutre (Hit man), convicted of first-degree murder, sentenced to life plus 30 years; Richard Savage (Hit man’s boss), convicted of second-degree murder and conspiracy, sentenced to 40 years. Disability: Partial paralysis from polio. John was stabbed to death. His wife, who had married him only three months before, most likely paid two men to kill him. She had been the caregiver for his deceased first wife, and the two had recently separated. John was a retired IBM executive. Perpetrator: Richard Vance Richardson (hired killer), pleaded guilty to second-degree murder, sentenced to15 years to life. Clinton Lee Burns, pleaded guilty to voluntary manslaughter. Charlene Richardson (Stepdaughter), charged with accessory to murder, sentenced to 6 months in jail. Barbara Muir (Wife), charged with accessory to murder, sentenced to 6 months in jail. Location: Fort Lauderdale, Florida, USA. Emily’s husband killed her by shooting her in the head. She loved tailored clothes and traveling, and was the mother of one daughter. Perpetrator: Roswell Gilbert (Husband), convicted of murder, sentenced to 25 years; granted clemency and released after 5 years. Received $50,000 for the rights to his story.